Provide comfort for the family of Mary Scrivens with a meaningful gesture of sympathy. 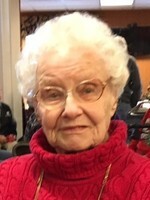 Mary T. Scrivens, 95, formerly of North Adams, MA, passed away Saturday, April 13, at the skilled care community of The Overlook, Charlton, MA..
Mary, predeceased by her husband, William L., in 2012, and cherished by her family, was born in North Adams, on October 10, 1923, to the late Albert and Margaret (Fogg) Robare (Robert). She graduated with the class of 1941 from the former St. Joseph’s High School in North Adams, and then graduated as a Registered Nurse from the former St. Luke’s Hospital School of Nursing, Pittsfield, in 1945. Mary devoted over 35 years as a maternity nurse at the former North Adams Regional Hospital. Her children fondly recall while growing up in North Adams hearing from many former maternity patients the wonderful care that Mary gave them before, during, and after their infants were born. This included everything from great back rubs to delivering their children when the doctor was late. For over 20 years, Mary volunteered as Vice President of the North Adams Life Right, a local chapter of the Mass. Citizens for Life, Inc. She spent time with many a pregnant woman and new mother, connecting them to services, disseminating donated cribs, clothing, etc., and just as importantly -- providing emotional support. Ever the consummate nurse, Mary tirelessly cared for her elderly mother, several of her siblings, and countless relatives in their elder years, as well as neighbors. In her 80s she drew upon her seemingly bottomless strength and inner fortitude to care devotedly for her husband Bill throughout his long-term illness. Mary, the youngest of six children, outlived her five siblings: Dorothy Noble, Francis Robare, John Robare, Paul Robare, who died tragically in a plane crash in his early 20’s, and Margaret Evans. Mary leaves her three children: Paul and his wife, Kerry, of Ludington, MI; Meredith Scrivens-Greene and her husband, Mark Greene, of Stafford Springs, CT; and Rosemary Scrivens of Worcester; four grandchildren: Kelley Scrivens, Chelsea Bean, Emily E. Greene and Thomas F. Greene; and a great-grandson Ashtin Bean. She is also survived by many nieces and nephews. Mary will be deeply missed by her children, who admired her strength, inner fortitude, wonderful quirks (those red shoes! ), and sense of humor when the going got tough (“If you don’t laugh, you’ll cry”). Calling hours will be at Flynn & Dagnoli Home for Funerals, WEST CHAPELS, 521 West Main St, North Adams, MA 11:00 AM - 1:00 PM on Thursday, April 18, 2019 followed by a celebration of her life at the funeral home at 1:00 PM. Burial will follow at Southview Cemetery, North Adams. In lieu of flowers, memorial contributions can be made to Hospice Care in the Berkshires. To add to the Book of Memories, please visit www.flynndagnolifuneralhomes.com. To send flowers in memory of Mary Theresa Scrivens (Robare), please visit our Heartfelt Sympathies Store. Provide comfort for the family of Mary Theresa Scrivens (Robare) by sending flowers. May the family of Mary Theresa Scrivens please accept my sincere condolences hoping you find comfort in God's words at Acts 24:15 and Psalm 37:29.